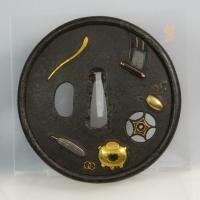 Very interesting tsuba with design of tea ceremony utensils, early to mid-Edo period. Katchushi plate may be from Momoyama - early Edo. The plate was skilfully adorned with tea utensil ornaments in mid-Edo period.